It had been years since I dined with the neighbor-mother of a boy whose due date was within a week or so of Calvin's. However, Calvin, now fifteen, came into the world six weeks early, and from then on the trajectory of our sons' lives would forever be diametrically opposed. 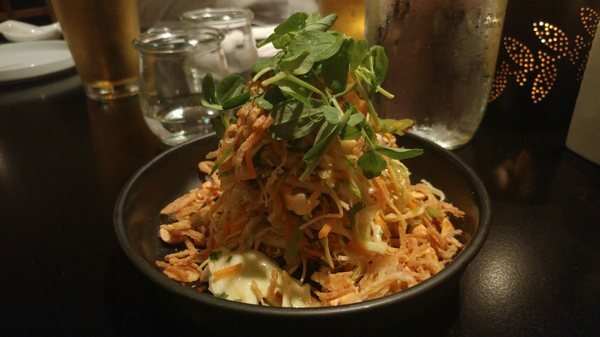 Kathy and I sat in a corner table near the bar sipping beet yuzu martinis and wielding chopsticks to munch a shaved-cabbage, pea shoot, crispy-shallot, and roasted-peanut Asian slaw. My friend ordered pan-fried vegetarian dumplings. I got the ones with pork. We caught up a bit on our and our husbands' recent endeavors and shared worries about our children. We laughed and chatted with a friend seated next to us whose daughter, also fifteen, is in the wonderful thralls of what it means to be a teenager, just like my dinner-date's son. I find myself hungry for stories of other people's kids even though they often trigger a bittersweet sting. My love for kids—their silliness and wit, their quirkiness and crazy antics, their world curiosity, fearlessness and old-soulness—is largely unquenched because mine is nonverbal and incapable of learning and doing so many of the most basic things. My child is just becoming proficient at riding a trike on smooth, indoor floors, while his peers are playing soccer and lacrosse outdoors. My child is still being spoon-fed diced, minced and pureed foods, while his peers can make their own snack foods. My child is relating mostly with adults—teachers, ed techs, nurses, while his peers are hanging out together and are beginning to show interest in having sweethearts. My child is still playing with chew toys, while his peers are likely already beginning to think about college. Kristi, the woman seated next to us who I don't know very well, told me that she reads every one of my blog posts. She (needlessly) apologized for having not responded to any of them in written form. She wanted me to know how important she thinks my blog is for others. She went on to say that she even shares it with her children, encouraging them to think outside of themselves and into of the lives of others. I was most humbled by, and grateful for, her affectionate show of appreciation for what has become for me such a labor of love. While Kathy and I drank and dined, a handful of Bowdoin College English professors filed in slowly and were seated at a nearby table. Three of them—Ann, Marilyn and Aaron—who are dear to me and whom I don't see nearly often enough, came over to visit briefly and to give me big hugs. Throughout my years of living in Maine, they've all been a source of strength, love and damn good humor. When our drinks were empty and our bellies were full, we got the bill and Kathy kindly paid for our meal. Upon leaving, I gave each of my friends one more hug. As we left the cozy indoors, we were greeted by a cool and invigorating April breeze. I remembered what I'd said to Kristi before we were served our meal: March, which was so full of seizures, had been hellish for Calvin and me. But last night, having begun a new spring month, I left the restaurant feeling new and alive, loved and buttressed by so many kind, compassionate, generous, and wicked-smart people, many of whom are still kids at heart. No wonder I like them so much. I also read all of your blog posts and, to date, have never commented. I thought I'd change that now so you know that you ARE reaching people. Sending love! Gosh, Calvin is fifteen? How is that even possible?